Is quinoa still healthy if it's coated in chocolate? No? Well this is dark chocolate, and there's blueberries in there too, so I'm going to call this health food anyway. Plus it was on the clearance rack, so I saved money on it to boot! Win-win! Whenever I'm at Target I look at the clearance grocery section because...I'm cheap! (Hey, don't judge! I'm a daily food blogger with a full time job, a delicate injury-prone Pomeranian, and a smashed car to deal with. I gotta pinch those pennies!) That little clearance shelf is home to all kinds of unique goodies, I got those avocado oil chips, that amazing India-style meal kit, and a few pumpkin spiced items. Every single one of those products were great, and I got them for less than their original price. So just because it's on clearance, doesn't mean it's not worth checking out. Let's see if this is another successful clearance rack venture! The packaging is simple. We've got a resealable foiled plastic bag that's been printed on. Nothing new there, but it looks nice. The design is clean, with a hint of background texture to keep things interesting, and the food imagery is appealing while the text is informative. 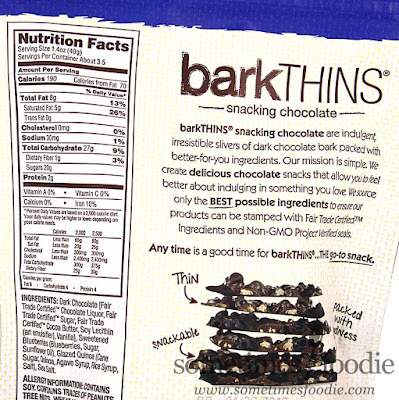 I like the overall layout and concept behind this product, but I'm not so keen on the typeface used for the work "bark" is looks so out of place with everything else. Admittedly I'm being nit-picky about it. I get that they wanted a contrast to the rest of the clean and smooth design, but I feel like that specific chalky-text-look isn't working. So, the bag looks pretty, and functions well, but you know what? It's pretty darn small! 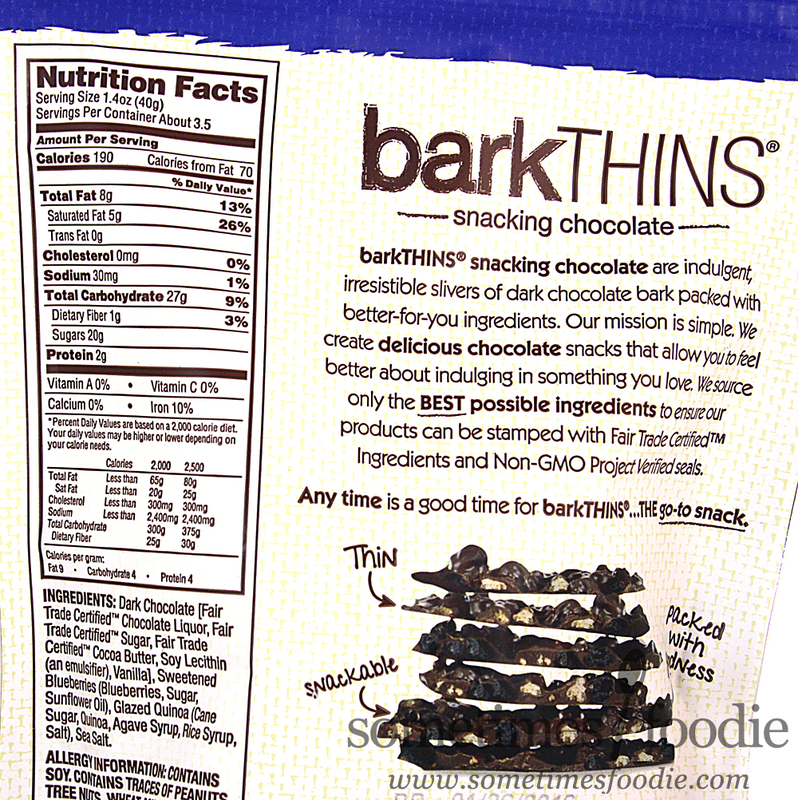 You only get a little less than 5oz of bark, which is roughly 3-classic Hershey's bars-worth of chocolate. But this has mix-ins... so for the clearance price I'm paying, $2.78, that's not too bad. This is made with fair trade ingredients after all. Then again, this was originally $3.99! That seems pretty expensive for such a small amount of candy. Those bits of Bark you see in my photos made up the bulk of the bag, but there were maybe 2-3 more that weren't photographed. There's only 7 pieces of chocolate here, and the nutrition breakdown says it's only 3 servings worth, so does that really warrant a resealable bag? I could easily eat all this in a day or two! Maybe Aldi spoiled me with their low chocolate prices. (Just mentally crunching all these numbers, given my recent car fiasco, makes my wallet cry.) Okay, moving on! Time to taste this bark and see if it's worth the price tag! 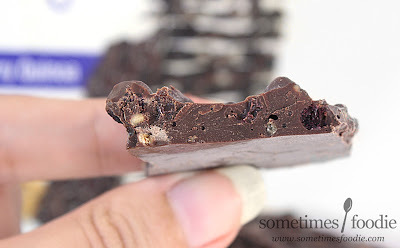 I took a bite, and the chocolate had a really satisfying snap to it! 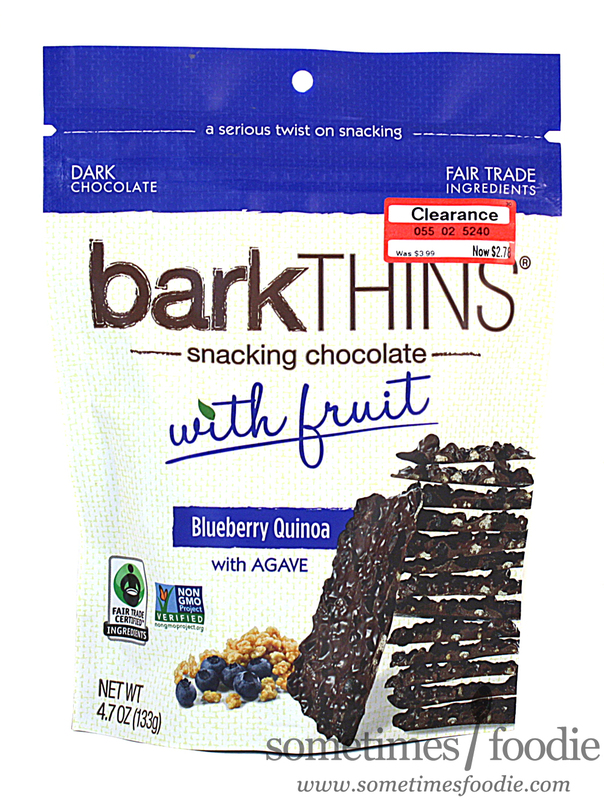 As I chewed I got crunchy cereal-like bits of quinoa and a hint of fruit-leathery dried blueberry bits. 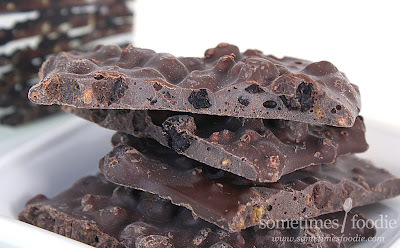 The chocolate quality is pretty great, and if I'm not mistaken, there's a hint of salt mixed in there somewhere to balance out the sweetness of the chocolate. (Which, even though it's dark, is a bit sweeter than I like my dark chocolates.) Overall, this stuff was really tasty and I felt like all of the flavors and textures worked perfectly with one another. The mix-ins seem pretty well balanced too! I got a bit of each flavor in every bite. Was one bark square satisfying enough to prevent me from going back for more? Nope! I have no willpower when it comes to food. (Hence my food hoarding situation and running a food blog.) I easily ate 2-3 pieces just photographing this stuff before ever writing all this up! Which just goes to show you how delicious and snack-able this stuff turned out to be. I really liked this a lot! Chocolate lovers, if you see this in a bulk bag, or on the clearance rack, I highly recommend grabbing a bag or two. I can't see anyone trying this bark and not loving it. (I mean, maybe if you absolutely hate dark chocolate, or you're allergic you might take an issue with it. But generally, this is great stuff!) The only trouble is the price tag and it's highly addictive nature, but if you look for sales you might be able to grab some on the cheaper side like I did. It's delicious and highly addicting, another great clearance rack find! As most of you can tell, I'm trying to post a few "healthier" snacks from my food stash this week, since the usual yearly resolution is to eat healthier or lose weight, but let's face it, this is a food blog. I'm not going to stop eating junk food or snacks any time soon, but the way I see it, I'm doing the rest of you a favor. By eating all this stuff I'm able to give you the foodie 411 and save you from wasting calories on the mediocre junk out there, and this stuff is definitely worth checking out.